There are some books that you start reading and know it's going to be an amazing experience, and that you won't be able to put the book down until it's over because you love it so much. The Selection was like that for me. I love a lot of books that I read, and then there are other books that I LOVE. This capital version is a more elite category of love -- reserved for books that are super special. The Selection is in this category, and will therefore be added to my "favorites" shelf on Goodreads. Now instead of gushing about how incredible this book was, I will try to put it in words for you in this review. First, let's start with the fact that I love reality television shows that have elimination factors, and The Selection has that in it. That instantly made it something great for me. I love the anticipation of making it to the next round in the competition, and seeing what people do to make the competition work for them. For some reason I find it completely fascinating. 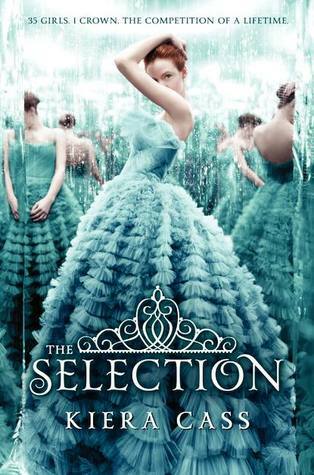 The Selection also had the fairy tale aspect added in. America is swept into the castle where she gets makeovers, new dresses, awesome food, and is taught how to behave like royalty. It's magical to read about. But there's more to it than that. The heart of this story for me was in America's character. She is such an amazing main character -- spunky, individual, gracious, and grounded, all without being full of herself. Keira Cass did a great job in creating an emotional connection to America while reading. I rooted for her through everything and felt like crying for her during other parts of the story. She's not afraid to stand up for what she believes in. I would root for America if I was an Illean citizen watching The Selection. The love triangle was wonderfully done. There is zero insta-love in this book. Aspen is someone America has been with for two years, and her feelings for Maxon grow naturally throughout the book. I am very much Team Maxon after reading the first book in The Selection. I think he and America will make a wonderful couple, and I hope the series ends with Prince Maxon choosing America, and America saying yes. I like Aspen as well, but I think he is more of a first love, and Maxon is true, mature love. I can't wait to see how this love triangle progresses. If you haven't gotten the message yet -- READ THE SELECTION! It's so amazing, and you won't be disappointed. PS: I forgot to mention how some passages were so amazing that I read them over so I could enjoy and relish in them again! Awesome review! I am seriously so excited for this book to come out on Tuesday! I hope you end up reading it! I'm not sure why there are such mixed reviews on it -- I thought it was INCREDIBLE!